"Thank you for a wonderful thought provoking day at the conference." "I thoroughly enjoyed the day ... an exciting and informative event with so many talented people in attendance." "Many thanks for inviting me to today's event. I thoroughly enjoyed and found informative the programme." To download the presentations from the conference, click here. If you are interested in becoming a member please contact members@SustainWorldwide.com. 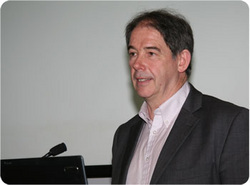 Speaker: Jonathon Porritt of Forum for the Future, a leading sustainable development charity. Speaker: David Goatman, Partner and Head of Sustainability Consultancy, Knight Frank. Speaker: Dominic England, Creative Planning Director at Brand Potential.